Reading will be commemorating the First World War Centenary in November with a range of events, parades, theatre, exhibitions and activities. Remembrance ceremonies will take place across Reading on Sunday 11th of November, paying tribute to the men and women who sacrificed their lives defending this country. Reading’s main service and parade will take place in the town centre on Sunday 11th November from 9.25am. The Remembrance Service will begin at Reading Minster at 9.25am, all are welcome to join the service. The service will be followed by a march through the town centre, led by the Waterloo Band and Bugles of the 7 Rifles, to the Forbury Gardens. The Remembrance Ceremony at the Forbury War Memorial will include the laying of wreaths and a two minute silence at 11am. Reading’s Mayor, Cllr Debs Edwards, said: “It will be an honour to lead the two minute silence at the Forbury War Memorial and I would encourage as many people as possible to join me. This ceremony is an opportunity for everyone to come together to remember those who paid the ultimate price in defence of our country and is particularly poignant this year, with 2018 marking 100 years since the end of WWI. There will also be services in Caversham at the War Memorial in Christchurch Meadows at 10.45am and at the Tilehurst War Memorial just before 11am. An exhibition featuring striking montages by the award winning graphic artist Paul McEvoy explores the lives and experiences of people in the town during the Great War. “Reading at War,” in association with Reading Museum, is on display at the Hexagon from Monday 29th until Sunday 11th November, daily between 10am-5pm (and during evening performances). The Hexagon is commemorating the 100th year anniversary of the end of World War One with Private Peaceful. Direct from London’ West End, the play relives the life of Private Tommo Peaceful, a young soldier awaiting the firing squad at dawn. Also at the Hexagon on Sunday 4th November, Terry Steel’s Astor Big Band and Singers present a concert including a host of Glenn Miller classics, with an added performance on November 11th. The Tilehurst branch of the Royal British Legion is encouraging the local community to help them to ‘Turn Tilehurst Red’ to mark the centenary of the end of WW1. From the 1st to the 14th of November they are asking for volunteers to help by making decorations, flags, banners, knitted designs the ideas are end-less. 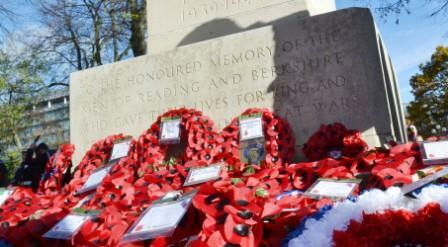 Visit the Facebook site ‘Turn Tilehurst Red for Remembrance Sunday’ to find out more.